Ceramic Wall Hooks with brass fitting with various styles & colors. Contact us for complete catalog..
We Manufacture and export creramic wall hooks made handicraft etc. With the assistance of our adroit engineers, we've got been ready to cater the purchasers with ceramic knobs hook. 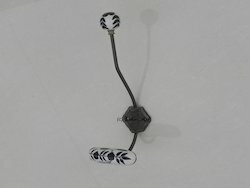 Offering high quality ceramic hook at very competitive prices. We have vast range ceramic hook.The ceramic hook are made from high quality Ceramic & metal for last lasting duarability. Which are very low on cost as well. Comes along with many designs. Get hooked to our exclusive range of hooks & corbels which brings character to your ambience. 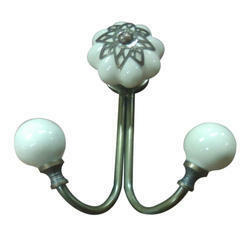 We are engaged in offering high quality of Ceramic Wall Hooks. Available in a variety of elegant designs, it is widely in demand in the market. It is extensively used in almost every household. We offer these Ceramic Wall Hanger at industry competitive prices to our valuable customers. Availablbe in many shapes, color and them. Contain high quality raw material. Turquoise Six Leaf Ceramic Hooks. When put on wall or cabinet it is an art in itself. This hook is strong enough to hold your cloths, keys, tea cups, coffee mugs, hand towels etc. We offer a variety of totally handcrafted Ceramic Stoneware tiles, Murals, Pouches, Planters, Alphabets, Numbers and many more gift and utility crafts. Our handcrafted tiles can also be used in Wooden and Wrought Iron furniture and handicrafts. We are the leading manufacturer and exporter of Kitchen Hook. Also, these Stainless Steel Kitchen Hooks are extensively used by the clients due to their accurate dimensions and perfect finishing. All these products are light weighted. In addition, we are offering these products at reasonable rates. Exclusive ceramic products are available with us.